Over the weekend I decided to get organized. First thing on my list? 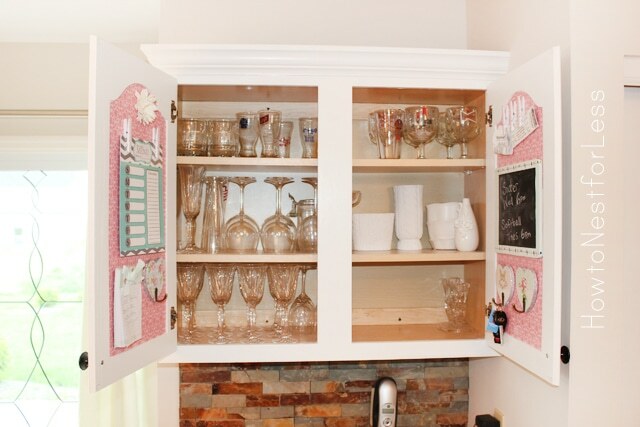 Set up a little Kitchen Command Center in one of our kitchen cabinets. And the best part? It’s hidden behind the cabinet doors right about our planning desk. 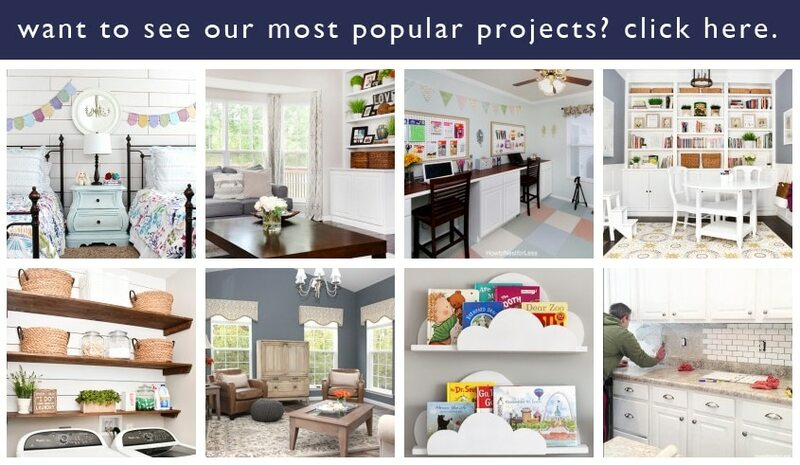 I knew I wanted a Command Center for awhile now above our planning desk but went to the web for some additional inspiration. 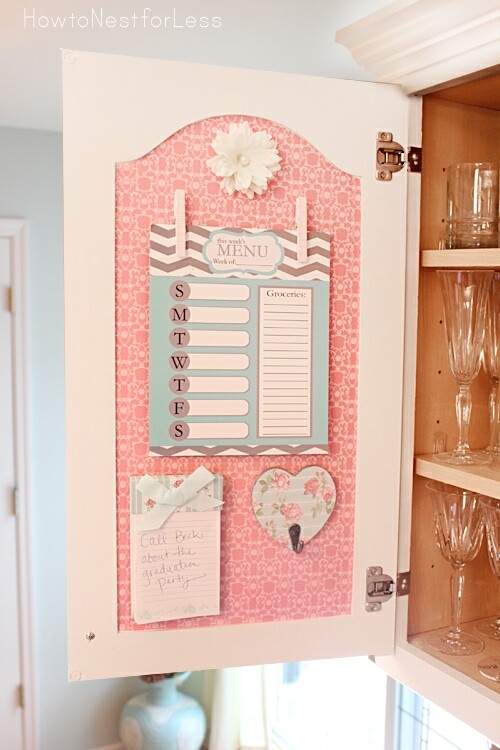 Then I came across Chelsea’s Hidden Kitchen Organizer that she shared over at Two Twenty One. Seriously almost exactly what I was thinking! I started by adding some colorful contact paper that I purchased from Michael’s (from about a year ago) to the inside of the cabinets. 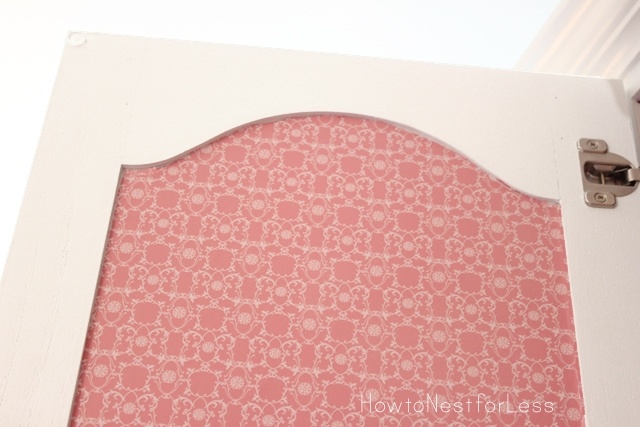 I stuck a little oversized piece in the cutout nice, then used an exacto knife to trim off the excess. Most of my supplies actually came from Michael’s in their $1 and $2 bins. 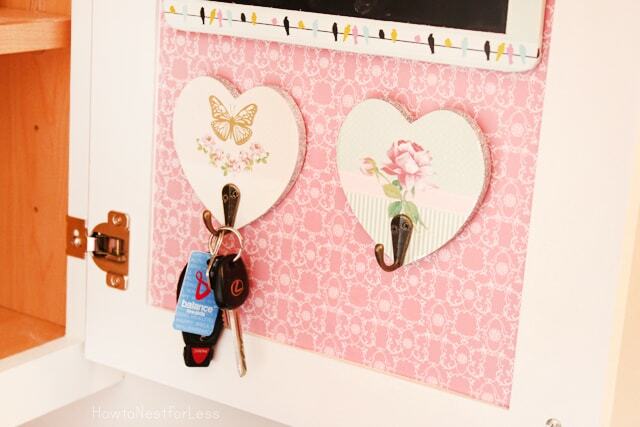 These hooks were simply adorable and perfect for hanging our car keys. 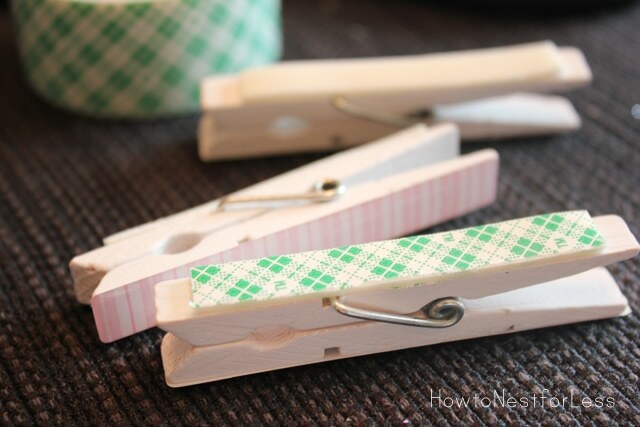 They had clothespins to match. I just added some double sided tape to the back and stuck them right on top of the contact paper to hold our weekly dinner menu and any other loose papers. 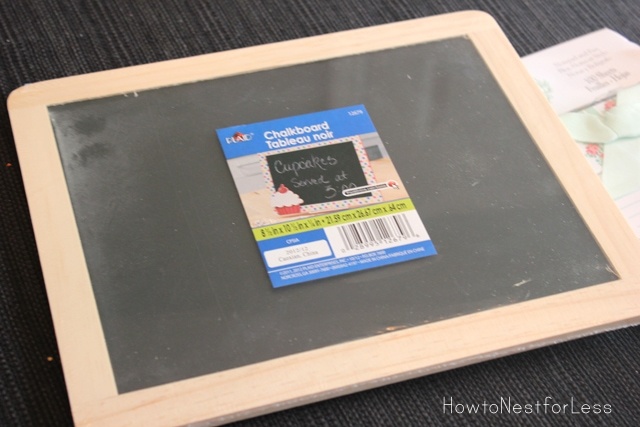 I also scooped up a super cheap chalkboard and covered the raw wood in washi tape. Wanna see the final results of my 20 minute project? 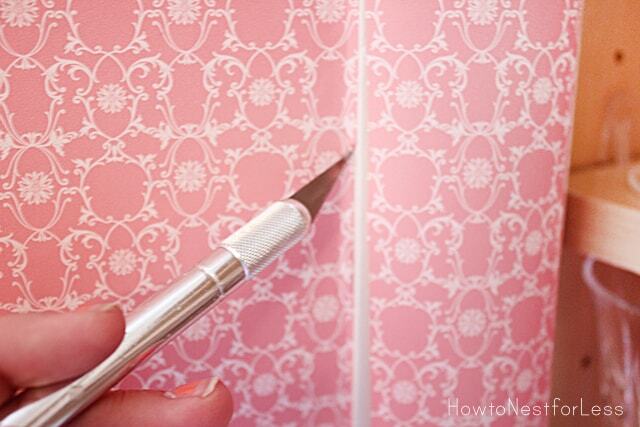 Seriously loving this contact paper. I’ll have to look back at Michael’s soon to see if they still have it because I have so many ideas for this stuff. 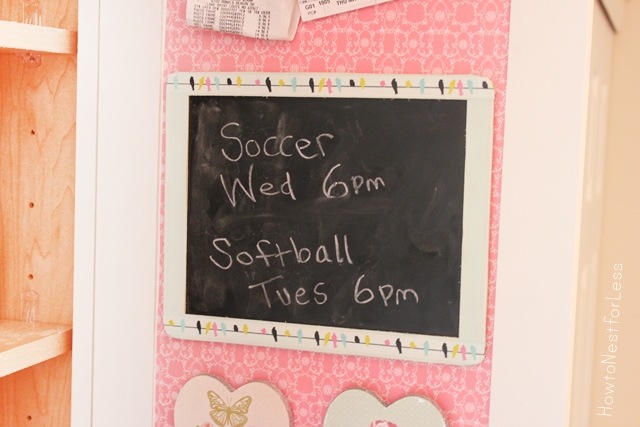 And my washi tape covered chalk board is a great place to write down reminders and schedules for the week. The dry erase menu board I got from the SNAP Conference last month. The bottom has a little notepad and another heart hook (both from Michael’s in their Dollar Bins aisle). The notepad is just held up with a Command Brand strip so I can easily swap out when it’s empty. Ahh, I just love opening these cabinets now and seeing a pop of color. 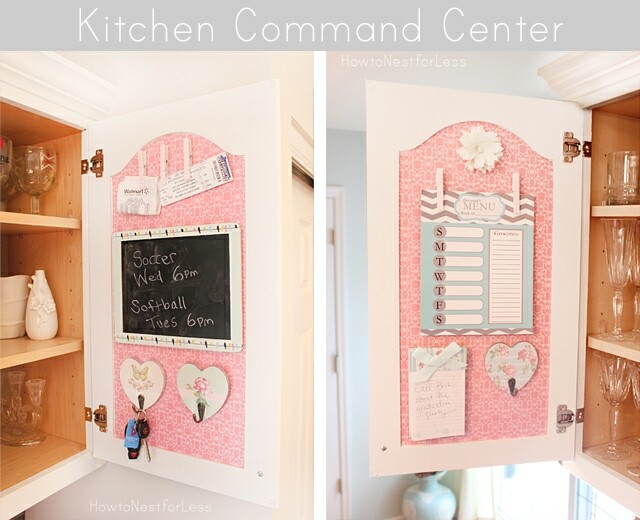 So are you thinking about making a Kitchen Command Center? I was actually quite surprised that this only took me about 20 minutes to put together and cost me less than $13 in new supplies to create. Yep, that makes me one happy, organized mamma. Cute and functional. Always the best. I need to do this in my office. I’m pretty sure the husband wouldn’t play along and things would still be thrown all over the desk. A girl can dream though, right? What a great idea. Do your cabinet doors close O.K. with the hooks and chalk boards? Yep! They close perfectly. I had to be careful with the hooks so my keys didn’t hang down too far, but everything worked out wonderfully! 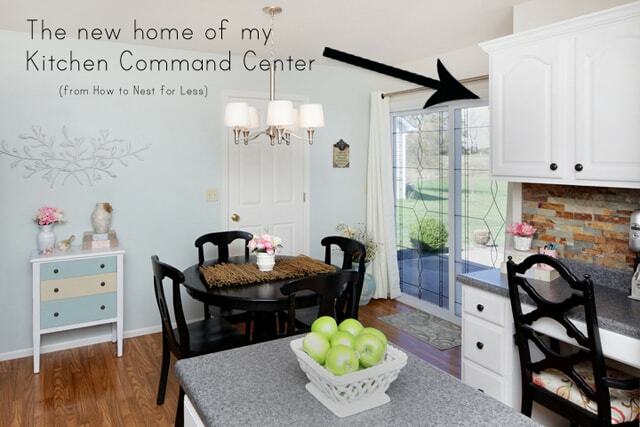 Love your command center!! Love the paper you used. 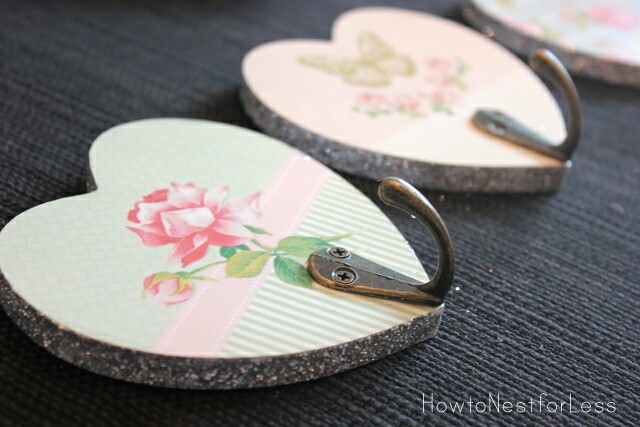 The heart hooks are so cute!! Love it all!! Aww, thanks Crystal! Let’s just hope it stays organized! I love it! 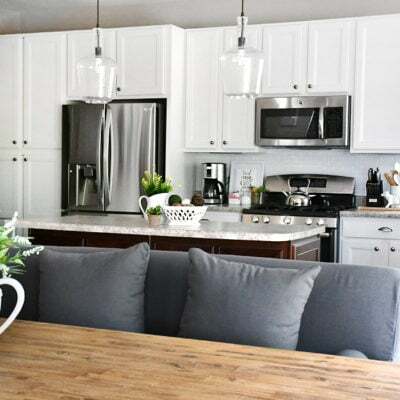 The pretty and soft colors fit perfectly in your kitchen. Lovely! And thrifty! Thank you for sharing! This is such a great idea! 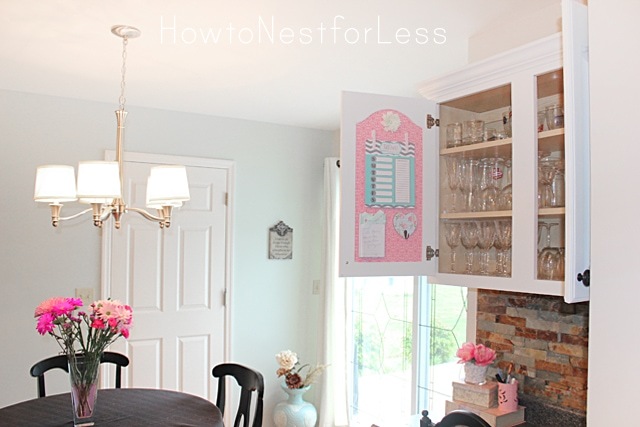 I love that you can close the cabinet door and it is completely hidden. 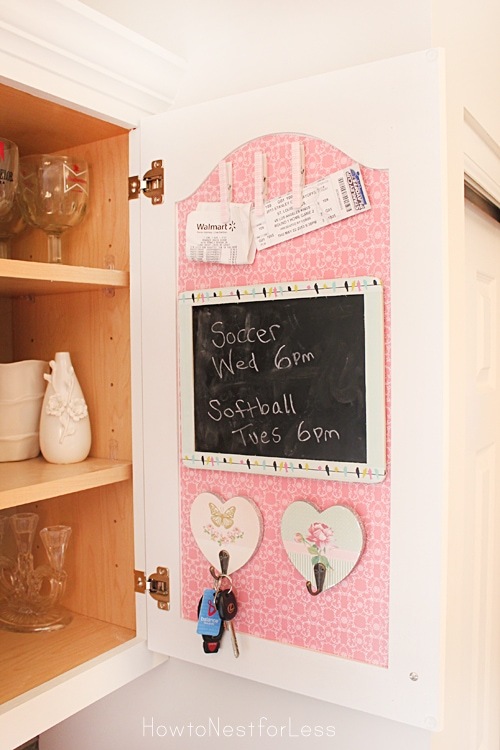 We just did a kitchen command center on a chalkboard wall, and I don’t know how I lived without one for so long. It’s great to feel more organized. How cute! I love how you keep it tucked away in your cabinets. We don’t have a ton of wall space in our kitchen so this is a great idea! I love that you’ve put it inside the cabinet so it can be hidden. 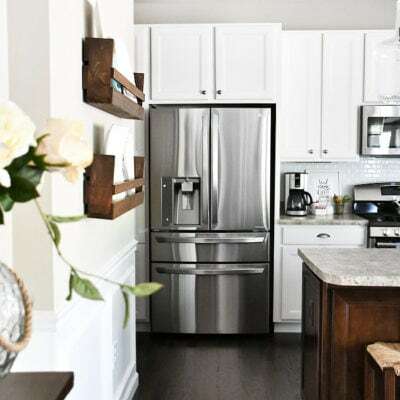 Do you find that the hooks get in your way when you’re trying to access things in the cabinet? I really need something like this. Thanks for sharing! Not at all. 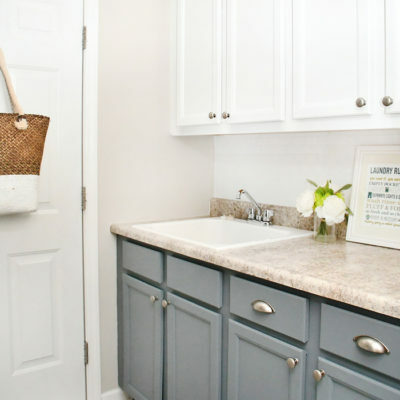 The hooks are very small and don’t take up too much space. 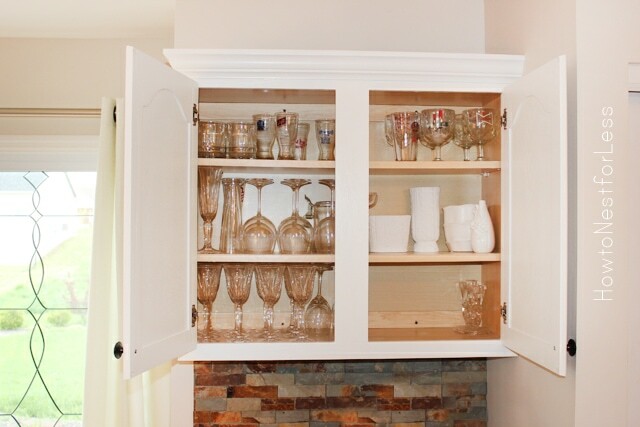 As you can see I have wine glasses and other items in that cabinet. No problems at all! I love how this came out! It looks so pretty and will keep everything organized at the same time! 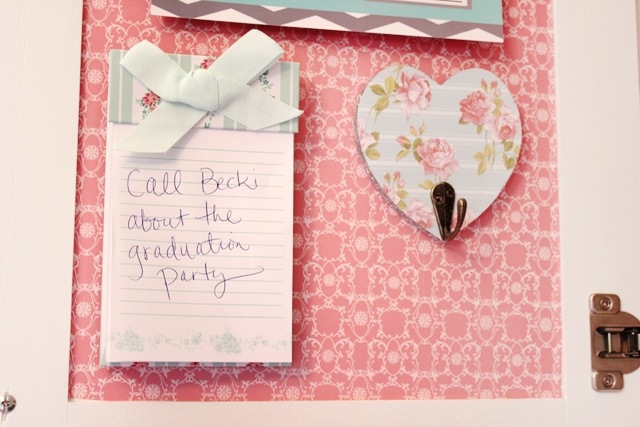 So in love with this idea. Looks Great!! 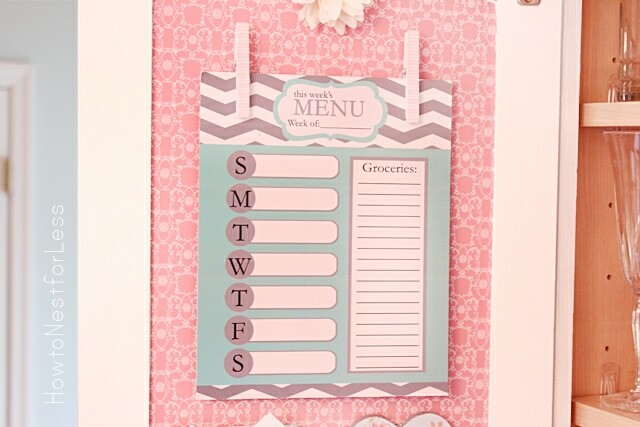 Is there a link to get the dry erase Menu board? Loving this! I’m on a mission for kitchen organization and this fits right in. Question: How did you adhere the hooks? With double-sided tape, too? 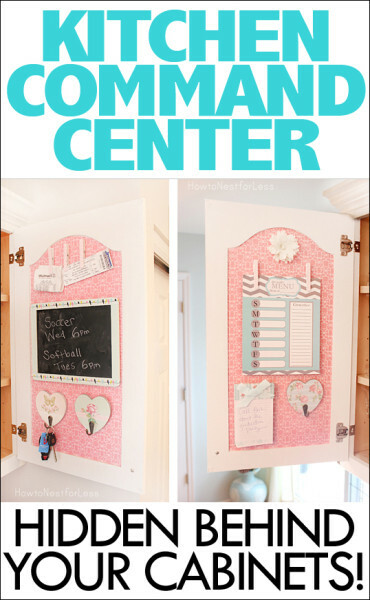 Love this….the one thing I would add would be someway to keep a dry erase pen, regular pen and chalk in the same spot.